“I arrived at the workshop with the excitement and openness of the child within me. Soon my adult inhibitions, self-consciousness, and self-doubt crept into my being, threatening to interfere. 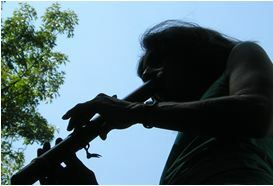 Ahhhhh, the soothing surrounding of nature, Erica’s gifted guidance and knowledge, and the sweet sound of the flute lifted me to a place of awe. My breath, together with the group sailed me to the place inside of my soul that is pure, free, and passionate.